With the commencement of cleanliness drive across the country initiated by Hon’ble Prime Minister of India, identifi cation of proper landfill sites for wastes assumes special significance. Solid waste dumping is a serious problem in the urban areas because most solid wastes are not dumped in the suitable areas. Therefore identifi cation of environmentally appropriate dumping site has to be planned objectively considering important thematic areas/limiting factors prevailing in mountainous region like Himachal Pradesh. It is with this objective, the current paper demonstrates the capabilities/usefulness of the GIS/RS tools, which can play a signifi cant role in planning and identifi cation of such sites. As the MC Shimla has already identifi ed their landfi ll site near Bharyal at Tutu Shimla, the methodologies/tools adopted in the paper may be useful in identifying suitable sites for other ULBs. Identifying suitable landfill site for municipal wastes has been a key concern for urban local bodies (ULBs). Due to several physiographic and natural limiting factors prevailing in mountainous regions, identifying suitable landfi ll site has been a contentious issue for Shimla MC in the past. The paper shall make an attempt to identify environmentally compatible and suitable sites in seven surrounding tehsils of Shimla and Solan Districts of Himachal Pradesh. 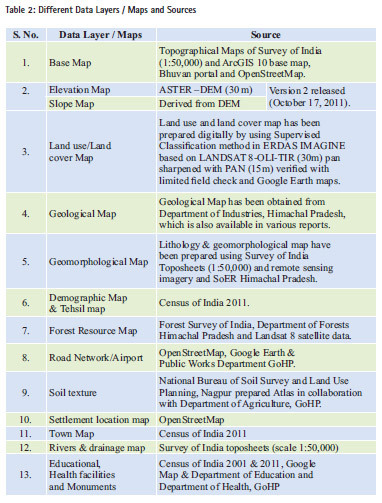 While assessing suitable lands, different thematic layers were taken into account for GIS based multicriteria evaluation (MCE) such as slope, elevation, distance from rail-line, road/ infrastructure of national and state significance, wildlife sanctuaries, land use/cover, distance from educational & health facilities, monuments/heritage, geomorphology, soil texture, lineaments, drainage network, and geology. Though, there is an every scope to enhance the accuracy of findings by increasing the spatial resolution of satellite imagery and other input data, some of them are available on cost-basis. The final suitability map is prepared by weighted overlay analysis of numerous thematic maps through the use of GIS and Image-processing software such as ArcGIS, Quantum GIS & Erdas Imagine. For this analysis, some of the medium resolution satellite data/sensors such as Landsat 7/8 based ETM+, OLITIR, IRS based LISS-III and other datasets procured from open source, have been taken into as primary inputs. Waste is a material discharged and discarded from each stage of daily human life activities, which, if not disposed properly, often leads to adverse impacts on human health and the environment (Bringi, 2007). Therefore, identifi cation of environmentally compatible dumping site is the key concern and important step in effective waste management. It has been observed that most solid waste disposal sites are found on the outskirts of the urban areas where there are water bodies, crop field, settlement, along road, etc. These are suitable sites for the incubation and proliferation of fl ies, mosquitoes and rodents. They transfer diseases that affect human health (Abul, 2010). Inappropriate disposal of solid waste can be manifested by contamination of surface and ground water through leachate, soil contamination through direct waste contact, air pollution by burning of wastes, spreading of diseases by different vectors like birds, insects and rodents, or uncontrolled release of methane by anaerobic decomposition of waste (Visvanathan and Glawe, 2006). Solid wastes indiscriminately thrown also results in aesthetic problems, nuisance, and pollution of land and water bodies of an area (Hammer, 2003). Municipal solid waste has also been recognized as one of the major problems confronting governments and city/ environmental planners the world over. India, one of the most populous countries in the world generates between 500- 700 gm of waste/head/day. However, the average waste generation in Shimla Planning area is estimated to be about 93 tonnes per day at an average waste generation of 350 grams/capita/day. The waste generation is characterized by high seasonal variations with a 30% increase in MSW due to tourist infl ow to the town (Shimla MC Report). In accordance with the MSW Rules, 2000 and JNNuRM requirements, only inert waste and rejects from processing facility can be diverted to landfi ll. In view of the same, landfi ll may be designed and planned for the waste of about 30 MT/day and hence, landfill plot size of more than 10ha has been selected/planned through this study. Locating suitable dumping sites for wastes attracted lots of studies and research from scientists. Distance has been primary criteria for such analysis. Several studies suggested that the solid waste dumping site should be located within one km buffer from the roads. Some argued solid waste disposal sites should not be placed too far from the roads to decrease the cost of transportations. Also solid waste disposal site should not be placed too close to settlement areas, and recreation centers and monuments of national importance etc. Therefore, maintaining balance in environment factors and economic concerns is of utmost importance. One can’t afford to compromise on environment and health concerns at the same time increasing transportation cost shall also lead to rise in vehicular pollution, which shall defeat the very purpose of environment protection. While identifying suitable lands for dumping of urban wastes, it is desired that suitable lands should not be far away from the current city, at the same time, it has to maintain certain minimum buffer to keep it away from the sensitive locations. Therefore, all the tehsils surrounding the city have been selected for the study and of them, fi ve tehsils are from Shimla District and two from neighbouring Solan District (Figure 1). 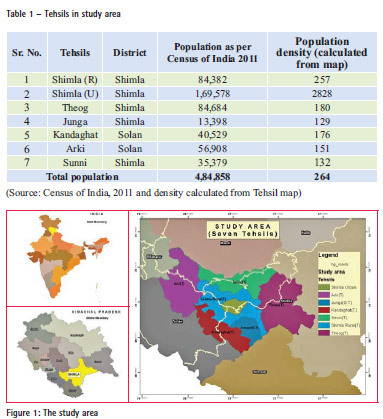 Demographic profi le of seven surrounding tehsils such as population and their population density as per Census of India 2011 is given in Table 1. The study used spatial multi-criteria evaluation (SMCE) technique to identify the most suitable solid waste dumping site. Spatial multi-criteria approaches have the potential to reduce the costs and time involved in siting facilities by narrowing down the potential choices based on predefi ned criteria & weights and permitting sensitivity analysis of the results from these procedures (Higgs, 2006). The solid waste disposal site selection mapping was done using multi-criteria evaluation and creating layers to yield a single output map. The regular procedures of digitization, georeferencing, supervised classifi cation, weighted overlays and other mandatory corrections were applied/ conducted in GIS/RS environment. There are some useful geospatial data/ image of moderate resolution of multispectral bands (MS) of 30 meters and 24 meters in public domain, which are available from Landsat and IRS respectively. The two important sources of such optical imagery of high temporal resolution, as on today, are available from the Landsat-8 and Sentinel-2. While the Landsat program is the longestrunning enterprise for acquisition of satellite imagery of Earth, operated since July 23, 1972 by USA and the current satellite being Landsat-8, however, recently launched Sentinel-2 is an Earth observation mission developed by ESA (European Space Agency) as part of the Copernicus Programme, which is equally useful in performing terrestrial observations in support of services such as forest monitoring, land cover change detection, and natural disaster management. The current study uses Landsat data for land use/cover mapping. Other thematic data have been collected from numerous sources such as Survey of India, toposheets, Bhuvan India, Census of India, Department of Forests, GoHP and from other open sources (Table-2). Though, some old data have also been updated through the help of Google Earth and OpenStreetMap as well. Suitability analysis in GIS environment is a GIS-based process used to determine the appropriateness of a given area for a particular use. The basic premise of GIS suitability analysis is that each aspect of the landscape has intrinsic characteristics that are to some degree either suitable, partly suitable or unsuitable for the activities being planned. Suitability is determined through systematic, multifactor analysis of the different aspects of the terrain. The present study is based on land/human resource data collected from various sources (Table-2), which have been weighted overlaid together using a common measurement scale and weights were provided according to its importance. 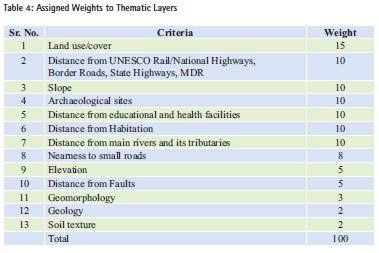 Different thematic layers, which were taken into account for multi-criteria evaluation using Weighted Overlay tool by incorporating thematic areas are soil texture, slope, elevation, educational and health facilities, monuments of national and state significance, land use/cover, geomorphology, lithology, drainage network, road network and geology. The Weighted Overlay tool applies one of the most used approaches for overlay analysis to solve multi-criteria problems such as site selection and suitability models. As with all overlay analysis, in weighted overlay analysis, one must define the problem, break the model into sub-models, and identify the input layers. Since the input criteria layers were in different numbering systems with different ranges, to combine them in a single analysis, each cell for each criterion has been reclassifi ed into a common preference scale such as 0 to 5, with 5 being the most favorable (0=not suitable, 1 = very less suitable, 2 = less suitable, 3 = moderate suitable, 4 = high suitable and 5 = very high suitable). An assigned preference on the common scale implies the phenomenon’s preference for the criterion. Produced suitability map is based on the criteria and weights as mentioned in Annexure 1. Land use/cover being the central criteria had maximum weight allocated followed by slope, which is important in the case of hill town like Shimla. Nearness to small road shall give additional advantage of accessibility to dumping sites. ModelBuilder application of ArcGIS has been used to create, edit, and manage models for the current study. Models are basically workfl ows that string together sequences of geoprocessing tools, feeding the output of one tool into another as input. ModelBuilder can also be thought of as a visual programming language for building workfl ows. Three models were applied to reach the fi nal identifi cation of suitable plot (Figure 2). In such assessment, it is also imperative to consider the natural limiting factor, ecologically sensitive factor, ecological protection factor for the safeguard of our fragile natural and man-made resources. 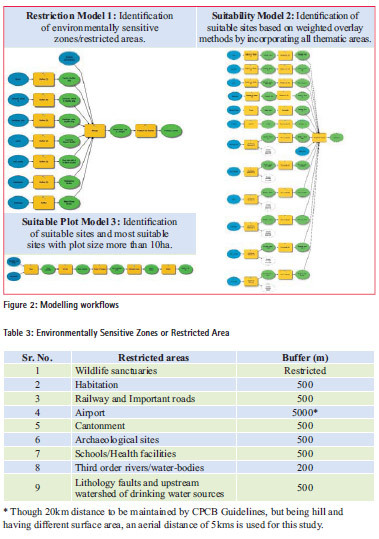 The Table 3 indicates such buffer areas, which have been identifi ed as the restricted zone due to nonsuitability of such lands for landfill sites. The thematic layers (Figure 3) were prepared based on data and maps collected from multiple sources as mentioned earlier and reclassifi ed as per the weights assigned in the weighted overlay matrix compiled at Annexure 1. Most of the reclassified thematic layers (Figure 3) were used as input layers for weighted overlay analysis. The following criteria have been identifi ed and their thematic maps prepared for the current study along with their assigned weights for suitability analysis as per the breakup indicated at Table 4. Criteria and relative weights have been adjusted to the distinct local conditions prevailing in mountainous region. Higher weights have been assigned to dominating criteria such as land use/cover, slope, distance from rail-line, main roads and main rivers, nearness to small road as they are very important in selection of suitable landfill sites. It is observed from the Table 5 that about half of geographical area is falling under non-suitable zone of the study area. While there is not a single site having very high land suitability, there is observance of some high and moderate suitable lands in different parts of the study area. The fi nal suitability map thus indicates that about 31 percent of total geographical area (TGA) of the study area is moderately suitable for waste dumping while only 5 percent lands falling under high suitable zone (Figure 5). The spatial pattern of the land suitability also indicates that suitable plots are more concentrated in Arki and Kandaghat tehsils of Solan District scoring more on wastelands and lower topography/slope. Nonetheless, patches of scattered suitable sites are observed across the region. The final suitability map also depicts that about half of the area is not suitable for planning landfi ll site on account of observance of numerous sites of ecological and historical significance. 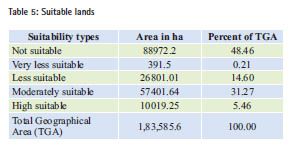 It is also observed that there is acute shortage of such lands inside the Shimla MC however there is small chunk of partially and moderately suitable sites near the periphery of Shimla Planning Area (Refer Figure 5). Furthermore, it would also be appropriate to develop small dumping sites at other locations for smaller towns located in other parts of the study area. Some dumping site may be located near to some large rural settlements by making their viable clusters for dumping their non-biodegradable wastes. It is worthwhile to note that earlier during 1999, Shimla MC had identified a landfill and waste processing site near Darni Ka Bagicha, which was found to be inadequate and gradually became ill managed, leading to environmental degradation and public nuisance. After Public Interest Litigations were filed in the Hon’ble High Court, the H.P. Government shifted the plant to its new location in Bharial located near Tutu. The above fi ndings have demonstrated the ability of GIS and remote sensing as a veritable tool for analyzing the criteria for decision support. The paper has taken land use/cover, slope, water sources, settlement, faults, geomorphology, geology, elevation, slope, soil texture, archaeological sites, educational & health facilities, airport, cantonment boards and transport facilities as determining factor in order to find appropriate site for solid waste dumping site. The results have shown that few suitable sites are present in the study area, however, there is no very high suitable zone owing to several restricting factors prevailing in the region. But there is high/moderate suitable zone around. These sites are easily accessible by the small roads but they are away from rail/roads of high significance. These places are also far away from any water sources and other environmentally sensitive variables put into analysis. They are also located in north-eastern and north-western parts of the study area on barren and waste lands with moderate slope. Hence, the capacity to use GIS and remote sensing technology for the effective identification of suitable solid waste dumping site will minimize the environmental risk and human health problems. While there is always a scope for improvisation with respect to tool and techniques of GIS and Remote Sensing, use of high resolution satellite data coupled with primary/field surveys and further use of knowledge in assigning weights to criteria, using them for our environmental management is of utmost importance. In addition, some of the distance criteria by CPCB seems to be plain-centric such as distance from airport is 20kms. While, this may need some re-look in hills and surface distance or other realistic distance need to be developed for mountainous region. The present paper is only a modest attempt to explore the broad opportunities that these geospatial tools offer us, to plan for a better landfi ll site in mountainous region. Acknowledgement: The author acknowledges the assistance rendered by Dr. Satish Negi, Associate Professor of Geography, Rampur (HP) and Mr. Narender Kumar, GIS Expert, MC Ghumarwin, Mr. Pawan Sharma, DEO, HP Pollution Control Board in making this paper possible. The idea/position adopted in the paper is independent of the institutional affi liation of the author. 1. Abul S., (2010). Environmental and health impact of solid waste disposal at Mangwaneni dumpsite in Manzini: Swaziland. J. Sustain. Dev. Afr. 12(7):1520-5509. 2. Antonie, J., Fischer, G. and Makowski, M., 1997. Multiplecriteria land use analysis. Applied Mathematics and Computation. Vol.85 pp.195-215. 3. Baban SMJ, Flannagan J (1998). Developing and implementing GIS assisted constraints criteria for planning landfi ll sites in the UK. Plan. Pract. Res. 13(2):139-151. 4. 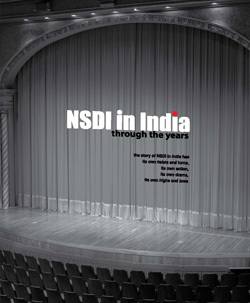 Bringi SD (2007). Application of 3D principles to solid waste management on the Asian Institute of Technology (AIT) Campus. Unpublished M.Sc. Thesis.Indonesia. 5. Central Pollution Control Board (CPCB), Guidelines and Check-list for evaluation of MSW Landfi lls proposals with Information on existing landfi lls August, 2008 (Ministry of Environment, Forest and Climate Change, Govt. of India). 6. Heywood, I., Oliver, J., Tomlinson, S., 1995. Building an exploratory multicriteria modelling environment for spatial decision support. In: Fisher, P. (Ed. ), Innovations in GIS, vol. 2. Taylor & Francis, London, pp. 127–136. 7. Higgs G (2006). Integrating multicriteria techniques with geographical information systems in waste facility location to enhance public participation, Wales. Retrieved on 9(07) 2012: http:// www.epa. sa.gov.au/pdfs/swlandfi ll.pdf. 8. Hammer G (2003). Solid waste treatment and disposal: effect on public health and environmental safety. Biotechnol. Adv. 22:71-79. 9. Jankowski, P., Richard, L., 1994. Integration of GIS-based suitability analysis and multicriteria evaluation in a spatial decision support system for route selection. Environ. Plann. B 21 (3), 326–339. 10. 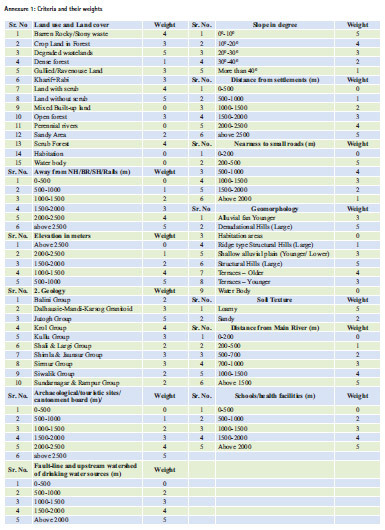 Nishanth.T., Prakash M.N., Vijith.H., 2010,Suitable site determination for urban solid waste disposal using GIS and Remote sensing techniques in Kottayam Municipality, India,International Journal of Geomatics and Geosciences, Volume 1, No 2, 2010. 11. Malczewski, J., 1996. A GIS-based approach to multiplecriteria group decision making. International Journal of Geographical Information Systems 10(8), 955- 971. 12. Municipal Solid Waste Management Plan for Municipal Corporation Shimla, prepared by Shimla Municipal Corporation. 13. Sudabe Jafari and Narges Zaredar,2010, Land Suitability Analysis using Multi Attribute Decision Making Approach, International Journal of Environmental Science and Development, Vol.1, No.5, December 2010 ISSN: 2010-0264. 14. Sumbangan Baja, Nurmiaty & Samsu Arif, 2014, GIS-Based Soil Erosion Modeling for Assessing Land Suitability in the Urban Watershed of Tallo River, South Sulawesi, Indonesia, Modern Applied Science; Vol. 8, No. 4; ISSN 1913-1844 E-ISSN 1913-1852 Published by Canadian Center of Science and Education. 15. Visvanathan C, Glawe U (2006). Domestic solid waste management in south Asian countries. A comparative analysis.